It’s been beautiful the past three days and I haven’t stepped outside anymore than I’ve needed to. There have been no runs in the sun, no walks in Duke Gardens, nothing outdoorsy taking place in my life. Instead, I’ve felt like I’m going to sneeze every 20 seconds and my nose is starting to resemble Rudolph’s. Allergies seem to be the culprit. I think I could star in an Allegra or Claritin commercial right now and I wouldn’t even have to act that I’m sniffling, sneezing, coughing, wheezing. It’s all real. In a large pot, heat olive oil over medium heat. Once hot, add in onion,carrots, and jalapenos and saute for 3 minutes. Add all seasonings (garlic through paprika) and stir to combine for about a minute. Add in hominy*, beans, and chicken**. Mix well in the pot and let cook for 2 minutes to allow everything to warm together. Pour in chicken stock and water. You want to make sure that everything is covered with liquid. Reduce heat to medium-low and let simmer for 20 minutes. Stir occassionally during the cooking process and adjust seasonings before serving. *Hominy — a variety of corn (I affectionately call it “corn on steroids” because the kernels are huge) can be found in most grocery stores in the Mexican or Hispanic food section (it comes in a can). 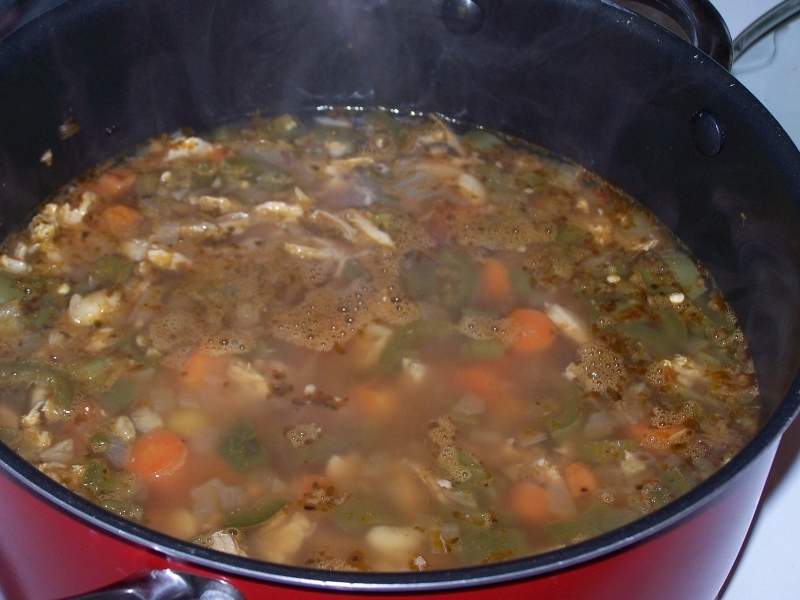 **Rotisserie chicken — I simply bought a whole rotisserie chicken from the grocery store, let it cool, and then shredded the meat to use for this soup. I removed the skin, but you can leave some on if you like the flavor. This soup is FILLING. And it’s incredibly healthy — lots of vitamins and minerals from the vegetables, plus some healthy fats from the olive oil. It’s a perfect dinner on it’s own and gets better and better the longer it sits, so this is a time when you can look forward to leftovers! Plus, if you’re stuffed up like me, the spice from the peppers and seasonings will help decongest you. Sorry, just need to whine for a moment. And yes, that’s whine with an “h” not wine. Though I’d much rather be doing that. My laptop caught a virus last night and I’m currently in the process of learning what caused my precious child to get sick. It’s sad how attached I am to my computer. But I really felt like a concerned mother when the screen turned bright blue and the word ALERT started popping up in red all over like it was chickenpox on a preschooler. I’m putting the health of my baby in the hands of some very competent doctors know as Best Buy’s Geek Squad. I’m sure they’ll make her better in no time and give her a special booster shot to try and prevent this from happening again. Not without a hefty price tag, of course. Unfortunately Best Buy doesn’t take Cigna. And last I checked, I can’t list an electronic device as a dependent. Wouldn’t it be great if you only had to fork over a co-pay when your computer needs a check up? I will get through this. Really I feel bad because I have a delicious soup recipe to share with you. But it will have to wait until Baby Toshiba gets a clean bill of health. Gallo’s Sauvignon Blanc is waiting for me back home. It was on a huge markdown at the store this week. It’s light, refreshing, and very easy to drink. Which may be a dangerous thing for me after all my anxiety today. So here’s a toast to all you geeks tonight and for the work that you do. It is very much appreciated.